Nix's Mate in Boston Harbor was once 12 acres in size. The island was used a pasture, and as a place for ships to load ballast. Pirates were hanged at Nix's Mate, with their bodies displayed there for a while to deter other buccaneers. "Nix's Mate is a large, gravelly shoal between Long Island and Gallop's Island, partly bare at low tide, and crowned by a singular and ominous-looking beacon. 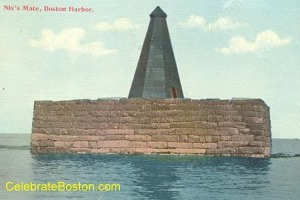 It is a massive piece of copper-riveted masonry, 40 feet square and 12 feet high, with stairs on one side, upon whose top stands a black wooden pyramid [replaced by concrete in World War II] that is 20 feet high. As early as 1636 this locality was known as Nixes Island, when it was granted to John Gallop; and at a later day, it divided with Bird Island the dishonor of being the place of execution for pirates, where the bones of these luckless sea-dogs were exposed in chains and on gibbets [t-shaped piers]. Murderers and burglars were executed on Boston Common or on Boston Neck; but the people whose crimes were perpetrated on the high seas suffered the penalties of the law in sight of its accusing waters. The most popular legend associated with Nix's Mate states that Captain Nix was killed at sea, and that his mate was charged with the crime, and executed on this island. He protested his innocence, and prophesized that the place that witnessed his judicial murder would be washed away by the angry sea. This is certainly not historical, for the present name was applied to the place in the 1630s, at a time when no man had yet been executed in Massachusetts for murder or piracy. Another form of the legend states that Nix was a pirate, who sailed into Boston in 1680, his ship well laden with treasures ravished from unarmed ships. Anchoring down the harbor, he and his mate went ashore on the island, on a dark night, and buried several bags of coin; after which, to keep the secret as close as possible, Nix murdered his companion, and buried him also. The continuation of the story is crowded with ghastly circumstances, not described here. For upwards of a century Massachusetts Bay was infested with pirates or freebooters, who plundered passing vessels at will, and were sure of a short, swift and stern retribution when caught. The most famous sufferer on Nix's Mate was William Fly, who headed the crew of the Elizabeth in a mutiny, while on a voyage from Jamaica to Guinea, and threw overboard the captain and mate. Afterwards they changed the name of their vessel to Fame's Revenge, and embarked on a piratical cruise along the American coast. But their prisoners rose upon them, placed Fly and three of his men in irons, and ran the Fame's Revenge into Boston, where the unfortunate buccaneers were executed. Fly was hung in irons, on Nix's Mate, over the graves of his confederates; and here his bones shook and rattled in the sea-air for many months, as a grim warning to all mariners. The Boston News-Letter reported that Fly "advised Masters of Vessels not to be Severe and Barbarous to their Men, which might be a reason why so many turn'd Pirates; the other Two seem'd Penitent, beg'd that others might be warned by 'em." An alternative to the origin of the name Nix's Mate was presented by Edward Rowe Snow. In The Romance of Boston Bay (1944), Snow quotes a letter written in 1700. A vessel was anchored off Nix's Mate, and the passengers could hear the strange sound of the waves striking the cliffs on part of the island. A Dutch passenger called the noise Nixie Scmalt, which purportedly translated in old Dutch to old English as "The wail of the water spirits." The bones of pirates were long washed away at Nix's Mate, but do their restless sprits remain in the harbor? Please note that Nix's Mate is federal property, and is not opened to the public. No trespassing is allowed.